I went a bit nuts for two of Revlon's Parfumerie shades when the line first came out last year. Autumn Spice and Italian Leather are gorgeous, but what really stunned me is that they smelled good! When Nichole posted her swatches of the enticingly vampy Wild Violets, a small lemming started growing. My big worry was the scent. Floral. Hmm. I forget exactly what deal tipped me into buying Wild Violets recently, but I finally did it. 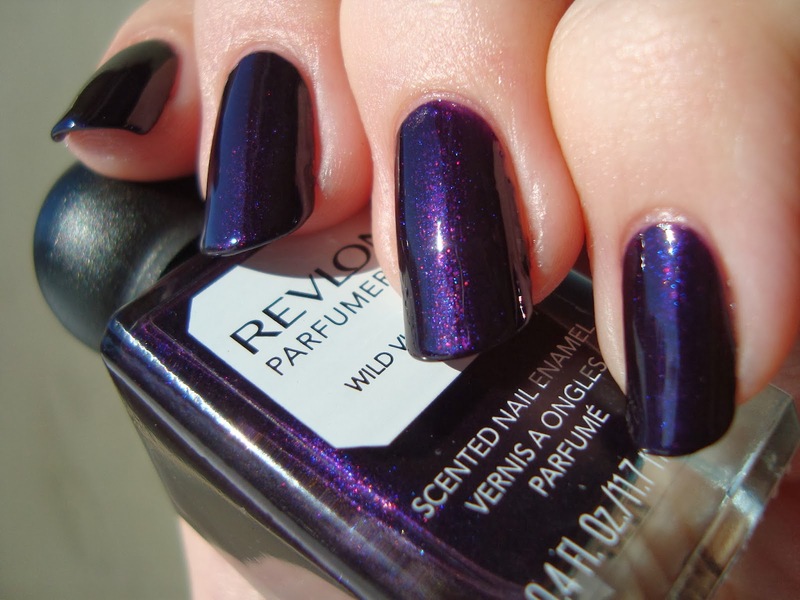 Wild Violets is a very dark purple with fine, subtle blue and red shimmer. The shimmer's subtle, but it's there in bright light. I'm reminded a bit of OPI Russian Navy. If Russian Navy and Siberian Nights had a baby, Wild Violets might be it. The formula's good. I used two coats and it went on as smooth as the other two Parfumerie shades I've tried. ...and now the elephant in the room. How does it smell? It's sweetly floral, but with a sharp undertone that really put me off. It reminded me of a coverup-style room spray or a scented cleaning product. It smells like it has something to hide. Back to the visual again for a moment, the shimmer never fully goes away, but it's semi-hidden. Even at its shiest, it still gives Wild Violets a great sheen. That smell though. It's not horrible, but I'm not sure if I can wear it again. Nichole called me names and told me the scent would get better as it dried fully. I took a nap because of a headache (I won't blame the scent, but I also won't swear it's innocent) and sniffed again when I woke up. It wasn't as sharp on the backbeat as it had been, but I still can't say I liked it. Bottom line: Lovely color, but the smell hits me more as a coverup than a fragrance. Nichole raved about it, but I'm honestly not sure if I'll be keeping Wild Violets or not. Do you own Wild Violets? What do you think of the scent? When this shade hits the light it looks amazing, would you say that its very noticeable or does it just look dark overall? on me, it just looked like a dark violet. The shimmer was not very up-front. It's there, but it's on the subtle side. I never just looks like a cream though.